Little has been known about the scout snipers seen urinating on dead Taliban corpses in a video that spread worldwide — until now. 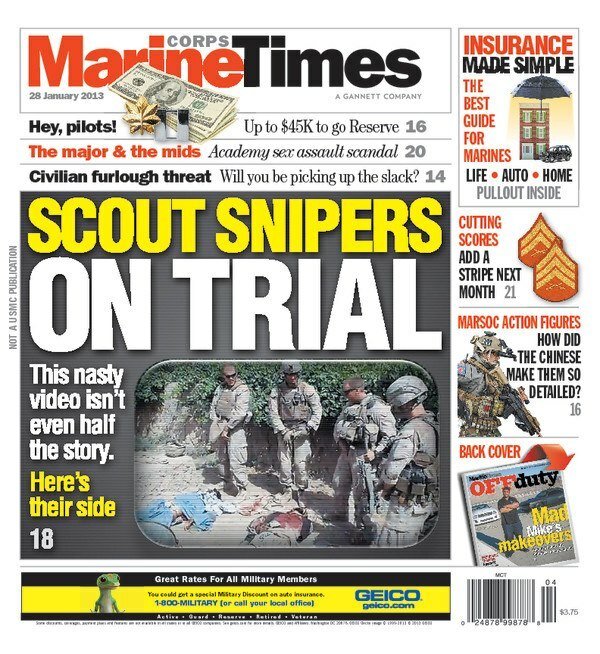 This week’s issue of Marine Corps Times offers the perspective of one of the snipers involved in the now infamous video that had widespread implications at home and in the war zone. Staff Sgt. Edward Deptola, a platoon sergeant with 3rd Battalions, 2nd Marines, testified during his court-martial Jan. 16 that the Marines thought the men on whom they urinated were responsible for laying an improvised explosive device that killed their friend weeks earlier. He said the insurgents were “armed to the teeth” and ready to kill Marines. Deptola was the fifth Marine to be punished for his role in the incident, and the second to face court-martial. He was busted one rank to sergeant, avoiding a harsher sentence recommended by the judge — including jail time, demotion to private and a bad-conduct discharge — through a plea deal he made with the prosecution. The prosecution argued that Deptola set a poor example for his junior Marines, and should not be allowed the privilege to lead again. But Deptola’s defense council, Maj. Tracey Holtshirley, said a Marine who served his country for nearly a decade should not be judged on one incident. And while Deptola’s court-martial might be behind him, it sounds like there’s more to come on this front. The judge said the video was just one of of 12 filmed that day. And part of Deptola’s plea deal was that he’d be a “cooperating witness” in the Corps’ case against two more Marines who might face court-martial. Check out this week’s issue of Marine Corps Times for more on the story, or read it on our PRIME site here. Also in this issue: hefty bonuses for aviators who go Reserve, a in-depth guide to insurance and details on the new MARSOC action figures.